I thought I'd share a few pics of my Cyclone. As you'll see, it's been through a bit of a transformation! I just gave it to my local luthier, suggested Lake Placid Blue and that he should rescue as much of the original "patinated" hardware as possible. NB. The discoloration on the scratchplate is what he found once he'd removed the paint. 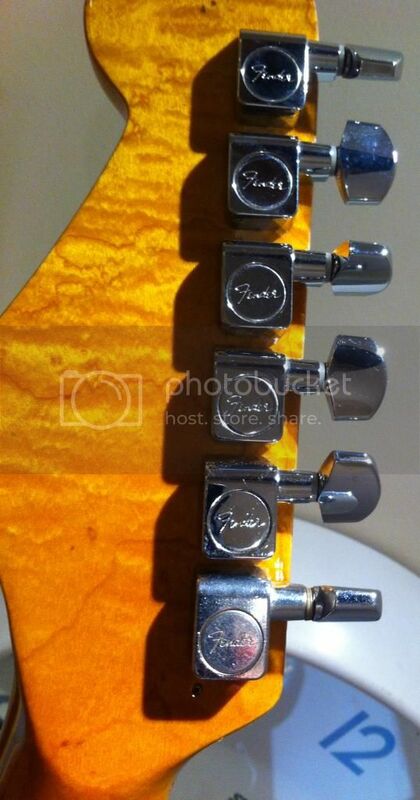 If anyone has suggestions as to the origins of the guitar (was this a Squier? ), I'd appreciate it! Those Cyclone looked really nice all beat up.. You should of just upgraded the electrics , made sure everything is straight and cleaned it up with some lemon oil ( that's just me) . I do dig the blue though.. I've been kinda digging the Cyclones lately . 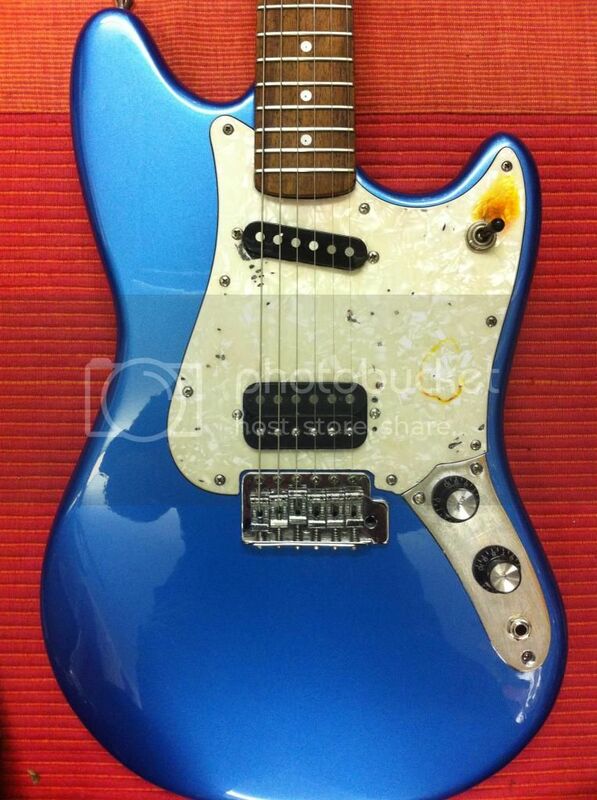 Maybe someone had an earwax toggle on there and it melted onto the pickguard. Jokes aside, smoke damage perhaps, chemical reaction? Seems very isolated though, the smaller yellow area to the right of the neck pup could of had a sticker on there at some point. 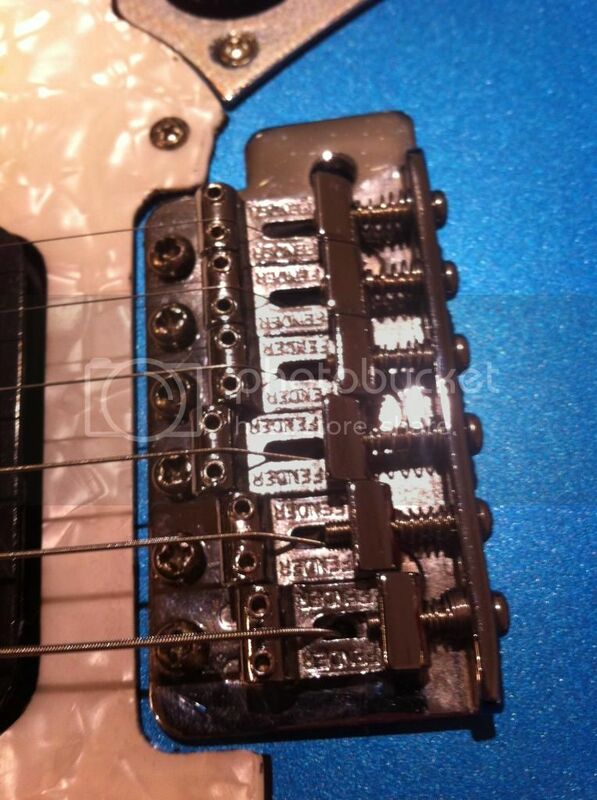 My guess is that it was a Fender because of the tuners, unless those are new. The neck pocket would give you some info if your guy didn't paint over it. Is the neck plate branded? When I first got it, I thought "Squier", primarily because I didn't think someone would want to trash a Fender quite so badly (the first picture above doesn't do it justice). Obviously, that's a rather naive viewpoint! 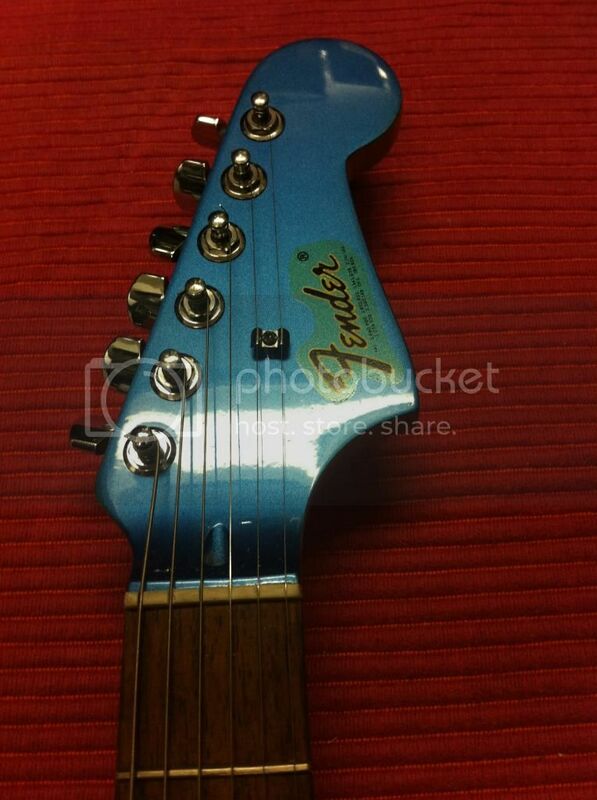 However, following a few subsequent conversations with people, I've since tended towards Fender too. The truth is, I just don't know - and most of the clues have been removed. *Neck pocket - IIRC, it's been painted over. *I'm pretty sure the machine heads are original. *Neck plate - AFAIK, non-original, non-branded. In many ways, I suppose it's best to treat it for what it is (a non-original guitar with no history) and enjoy it for that - it would still be nice to know, though! the blue came out pretty nice I think..the gibson hat knobs look good on it, too..
nice flame on the neck wood! Was the Fender bridge on it originally? I always liked the cyclones with a hard tail bridge..